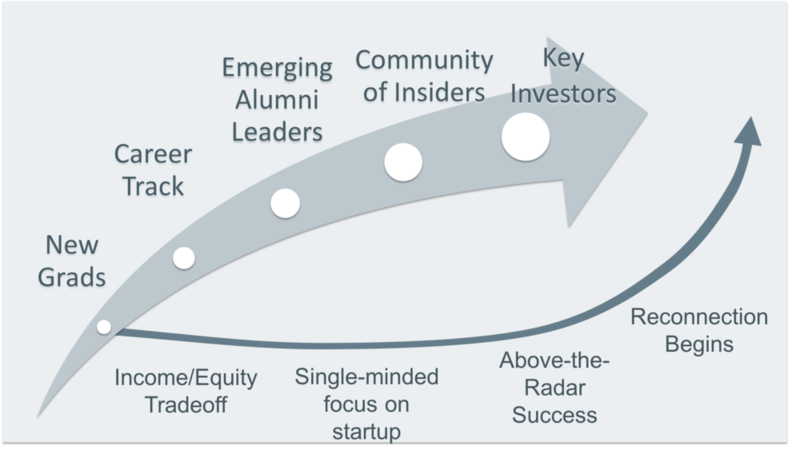 To achieve desired outcomes in philanthropy and innovation initiatives, universities can’t afford to delay engaging alumni in early stage startups. Entrepreneurs play a growing role in big philanthropy. While our sector [Higher Ed] is eager to work more closely with these folks, we’re still learning to address their unique attributes as constituents. Today I want to explore how those unique attributes show up in entrepreneurs’ engagement patterns — and why it matters. I’ll compare this to the general path of engagement and giving for a major gift donor, and examine where and why these trajectories split. Of course, individual stories vary. Let’s dive in. Along this curve, you see the trajectory of a typical relationship between a philanthropist and his or her alma mater. New alumni usually make modest gifts, which might be sporadic as they establish their careers. On the institutional side, schools emphasize making even a small gift each year. We work to build awareness of our news outlets, alumni directories, and regional clubs, seeking to build an audience that’s receptive and up to date. This work continues throughout the alumni lifecycle, but is especially critical in the early years. By the time a class is ten years out, their alma mater is making a concerted effort to discover alumni who could have a big philanthropic impact. Over time, those who feel close to the school may take on a volunteer role, and/or increase their support. Some do neither, and drop out of the pipeline altogether. Alumni leaders emerge from this process, and we shift them into a new track. As insiders, they connect with institutional leaders. They get deeper exposure to the university’s ideas and issues. They understand that they’re part of a community of key investors who help the institution execute on its most ambitious plans. 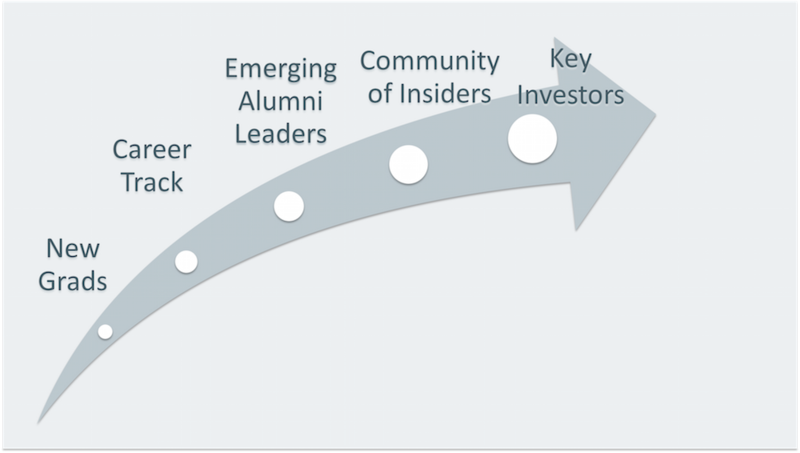 Now let’s look at the curve for alumni entrepreneurs. Initially, the patterns are similar. But entrepreneurs typically sacrifice some current income for equity in the companies they’re building. And they spend extraordinary time and energy getting their startups off the ground. This makes it hard for alumni in startups to stay connected through giving or volunteering — the two engagements Higher Ed values most. Even as a startup grows, it’s hard for institutions to understand how this affects an alum’s ability — or future ability — to support the school. An individual’s ownership in a startup is far from clear to the outside. That stake is also mostly illiquid. It can’t support a scholarship or help to build a new program until it can be exchanged for cash. It’s not uncommon for a “liquidity event” like an IPO or an acquisition to take 5–10 years. Our efforts to gauge philanthropic potential/inclination are muted by all this uncertainty. So, even alumni whose startups are killing it may not get invited to that insider track. We don’t spend time learning their interests. There is no clear path for them to make an impact, and they don’t see themselves in that community of emerging leaders. If a liquidity event seems imminent, the alum may get some personal attention from the university’s Advancement office. In these cases, wealth often comes suddenly and with fanfare. Reaching out for the first time when this happens risks seeming inauthentic to the alum. It may also get lost among countless other demands on their time. Equally likely is that the alum’s lack of engagement and giving puts them lower on the priority list. This engagement gap can also be a ‘zone of opportunity’ if a university tailors offerings to entrepreneurial alumni early on. Over time, these patterns become durable. Distance accumulates between the entrepreneur and her alma mater. 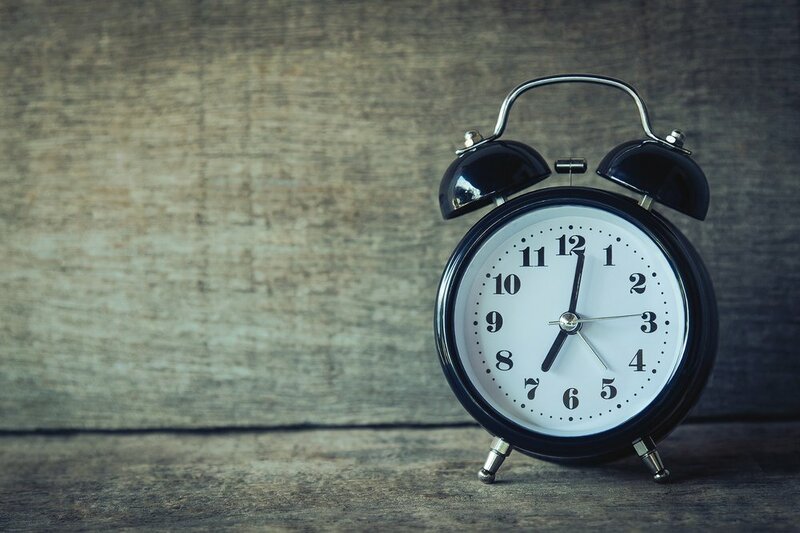 It takes a lot more energy to bend the engagement curve up when it’s been flat for a long time — and for some, we may never get that opportunity. Philanthropy is a direct outcome of work to engage alumni entrepreneurs early. Universities can also make their innovation efforts across campus more vibrant and fruitful. How can we increase the odds of achieving these outcomes? Keep in mind that it’s much easier to connect with an entrepreneur when their venture is young. Think about what early stage startup execs need. Design engagements around those concepts. It’s impossible to know which companies will pop, so connect with as many entrepreneurs as possible. Finding high-volume, low-bandwidth engagements will help you do this. Recognize that even early stage entrepreneurs think about philanthropy. Thousands have joined pre-liquidity philanthropy programs at universities and independent nonprofits. These programs give entrepreneurs a clear framework for giving back. Consider whether your institution could field a founders pledge, and how it might offer startup alums a foundation for effective philanthropy. Celebrate entrepreneurs for the multiple forms of capital they do give.In the early days, they’re more likely to give in ways that directly relate to their work. They judge pitch competitions, mentor other founders, offer internships and jobs, make referrals to alums, etc. Recognize the value of these gifts. Not only do they represent time and energy, but they’re also an investment in the institution’s startup scene. And that’s a connection you can build on. Ready to act? Read this next: The 4 Things Entrepreneurs Want from Their Alma Maters.